On the voyage of the Endeavour in 1770 the term ‘Labyrinth’ was used to describe the innumerable coral cays, reefs and shoals that challenged the navigational skills of Captain James Cook as he sailed along the northeast coast of Australia. The navigational puzzle took centuries to resolve through survey and mapping, but the complex intricacy of life below the surface remains a scientific curiosity. Colonial exploration of the New World was accompanied by an emerging European interest in natural science, and this quest for knowledge characterised the voyage of the Endeavour. Botanist Joseph Banks observed a great variety of coral and fish species in the seas. 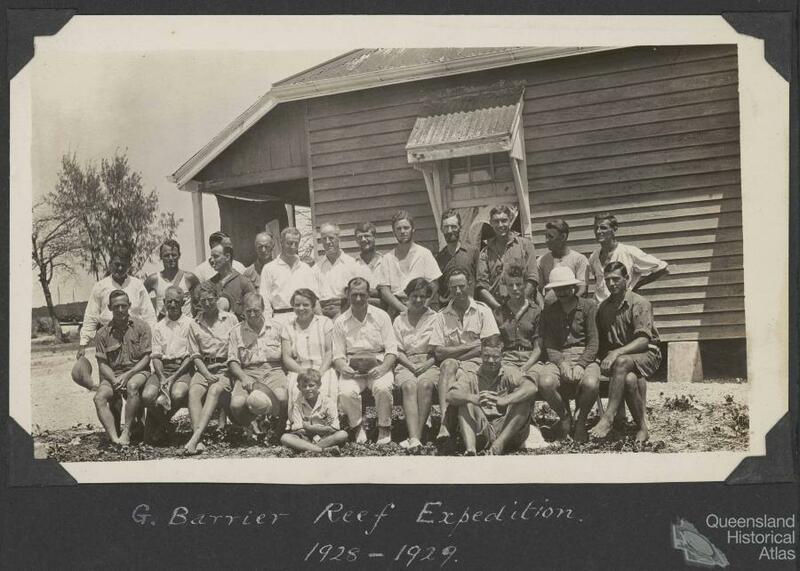 During later nineteenth century navigational voyages the underwater life of the Great Barrier Reef became a focus of scientific interest, and within a century the region became one of the most expansive marine science enterprises in the world. The European exploration of coral seas piqued interest in the origin of coral reefs and geologists sought to explain what they saw as rock emerging from the ocean beds. While early theories pondered the question of origin, naturalists accompanying navigators at the Great Barrier Reef began to realise the surprisingly colourful and varied life contained within. In 1847 naturalist Thomas Jukes aboard The Fly glimpsed the ‘full life and luxuriance’ of the corals while at anchor. He described the unrivalled colour and form of corals and fishes. These have become an enduring source of curiosity for scientists and visitors alike. 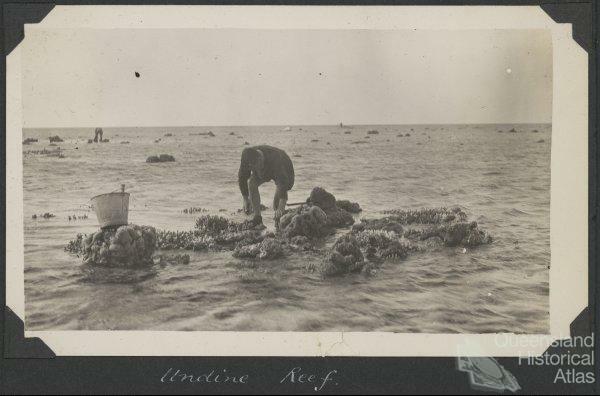 Observations of Reef life were somewhat incidental to British colonial consolidation. Global navigation was primarily driven by a desire to acquire resources, and scientific knowledge of the Great Barrier Reef was similarly motivated. 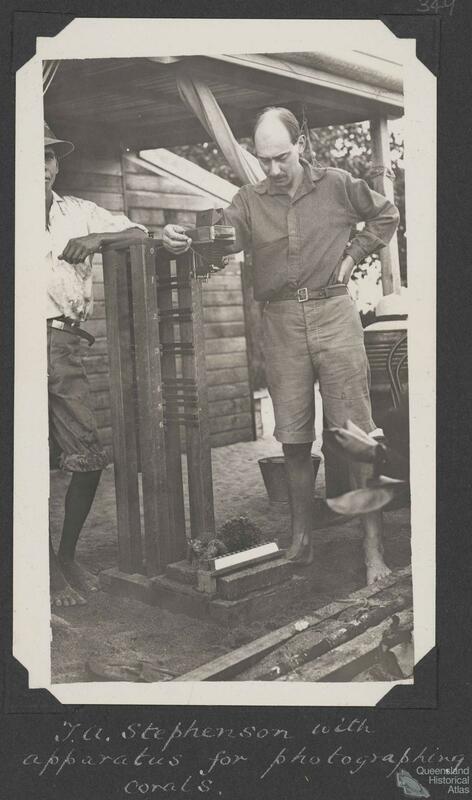 William Saville-Kent was foremost in researching the Reef as a rich and varied resource. 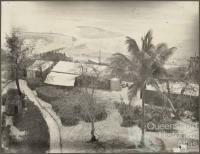 Saville-Kent was appointed Inspector of Queensland Fisheries in 1889 to investigate the dramatic decline in pearl shell. His curiosity in Reef corals, which dated to his time as curator at the British Museum, was quickly rekindled in the field. His study of coral reefs resulted in the landmark 1893 publication The Great Barrier Reef of Australia: its products and potentialities. As its title suggests, Saville-Kent focused on unique and abundant marine resources that might be used for colonial industries and products. It had a more enduring effect. With its striking black and white photographs and hand-coloured plates of corals and fishes, the book became a baseline for scientific research. The publication and its fine illustrations instigated a global curiosity in the Reef. 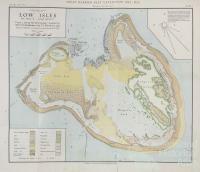 The highpoint of scientific research in the early twentieth century was the British Expedition of 1928-29 to Low Isles. 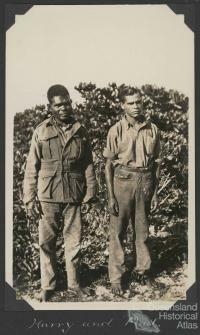 The Expedition was reported internationally, and created great excitement in Australia and Britain. The Melbourne Argus reported on 13 December 1927 that ‘The expedition had aroused more interest than any other topic at meetings of scientific societies in Britain’. The expedition comprised a team of talented young scientists led by Charles Yonge. Ten people, including three women (Anne Stephenson, Gweneth Russell and Martha Yonge) left London in May 1928. Dr Martha Yonge, the ‘charming young wife’ of Maurice Yonge, served as medical officer to the expedition. They were later joined by Sidnie Manton, zoologist and Elizabeth Fraser, Senior Lecturer in Zoology, University of London. 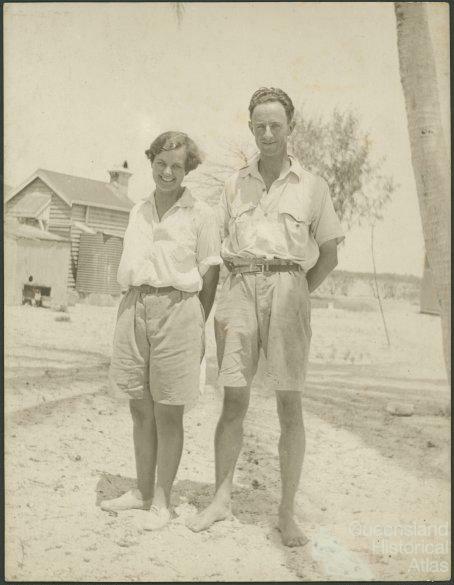 After leaving London in May 1928, they arrived in Brisbane in July and then travelled for two and a half days by rail to Cairns; and a further five hours to reach the Low Isles by launch. 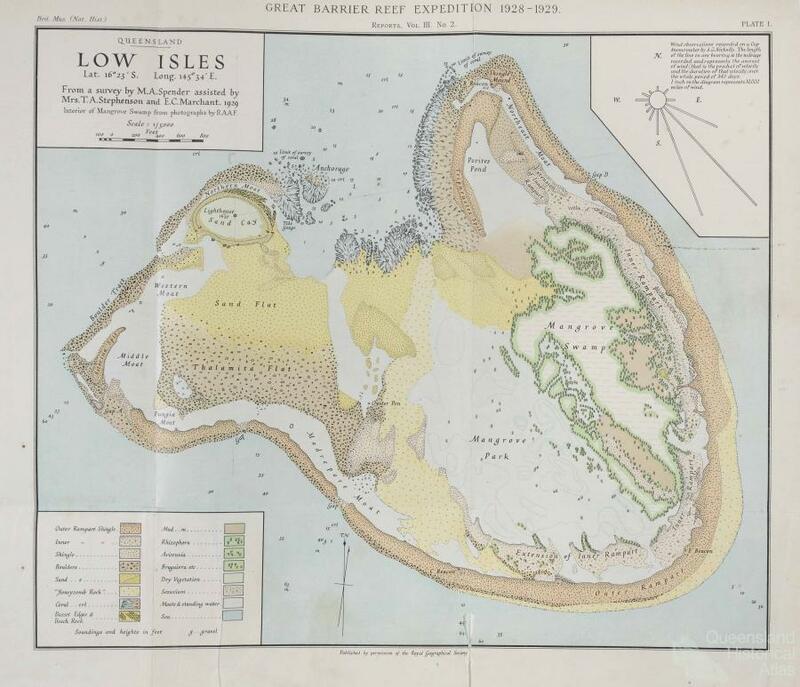 At the height of activity there were twenty-three scientists on Low Isles including five scientists from the Australian Museum and additional British scientists who joined the party for shorter periods. 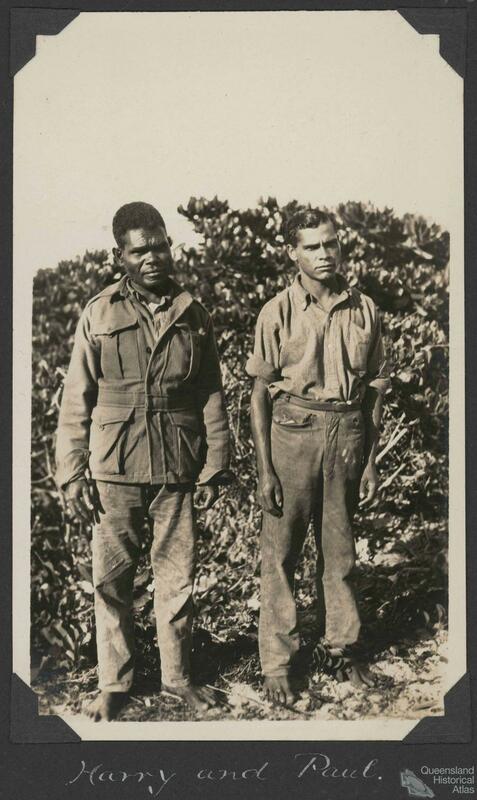 Several Aboriginal labourers from Yarrabah and a cook and domestic servant provided additional support to the expedition. Carefully planned, the expedition included the construction of the first purpose built research facilities on the Reef. The scientists thus wrought changes to the physical landscape. Nevertheless the facilities were rudimentary. Separate sleeping quarters were available for men and women, but some, including those from the Australian Museum, camped in tents. Exposed to the elements and working in open laboratories the environment had a reciprocal impact on the biologists. [A]s men of flesh and blood they sank slowly into a sort of melting decay under the savage heat of a humid summer. About 9 o’clock in the morning one begins to feel on Low Island as though one’s spine is being slowly boiled away. when somebody did at last manage to develop some photographic plates, an operation the heat makes almost impossible, and put them up to dry, the ants came and chewed off the emulsion. Twenty scientists are living on that island for a year. It is not a rest cure by any means. But there are such a lot of delightful things to be collected in the place that they put up with the inconvenience. The scientific discoveries of the British Expedition were well publicised. One of the first visitors to the Low Isles was journalist Charles Barrett whose newspaper articles were later published as a book. 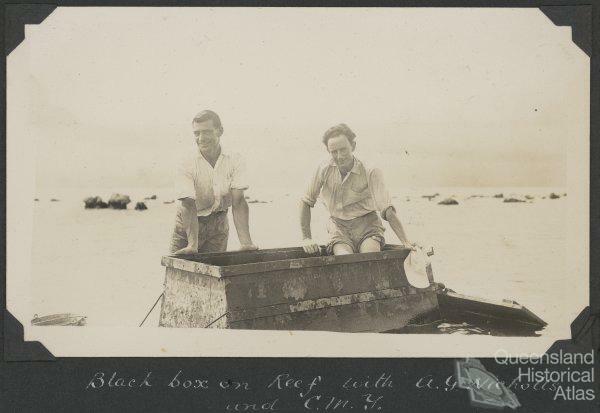 Other scientists from the expedition, including TC Roughley and C. Yonge, also published popular scientific accounts of the Reef. you may stand there every day for two hours on the edge of such a pool gazing through a water telescope and at the end of a month’s sojourn among them all find your ‘insatiable curiosity’ is still an ‘insatiable curiosity’. Massive numbers of shells and coral specimens were made for Museum and private collections. By 1966 the Prime Minister’s Department reported that Low Isles had been ‘virtually swept clean’. 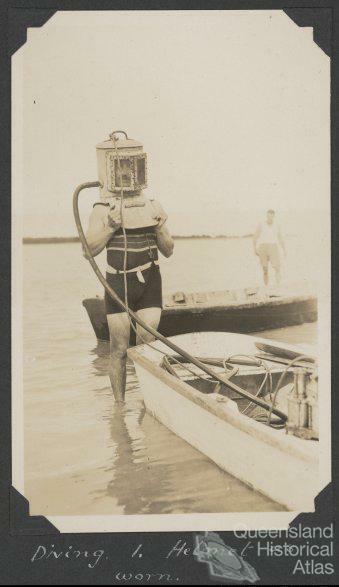 On the bottom the diver was engaged on whatever task he had before him. ... Fish, usually so elusive, are caught, surprisingly, unaware. They swim around regardless of this intruding member of the land fauna. Coral cod, parrot fish, an occasional fire fish perhaps, and a host of minute, brilliantly coloured species which live among the branches of the coral – all are there. Some, mildly curious, gaze into the window of the helmet, and a member of the expedition was one day surprised to find her entire line of vision obscured by the face of a great fish, probably a groper.